Our goal is to understand how the blood system works in health and disease. We are studying human stem cells because there are important differences between mouse and human stem cells. To study blood stem cells, known as hematopoietic stem cells or HSCs, we are using umbilical cord blood and induced pluripotent stem cells (iPSCs). These stem cells can differentiate into all blood cells which carry oxygen, carry out blood clotting, and participate in innate and adaptive immune responses. To study blood stem cells, we use lentiviral vectors to activate or silence the expression of key genes. We then assess the function of gene-modified stem cells by transplanting them into immunodeficient mice. 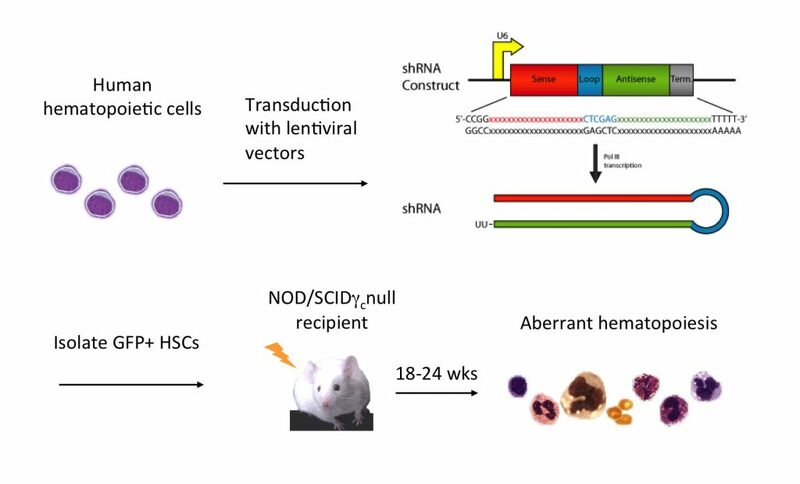 Human HSCs repopulate the bone marrow giving rise to human hematopoiesis in these mice. Primary human cells are in short supply, so we use induced pluripotent stem cells (iPSCs) as an alternative source. 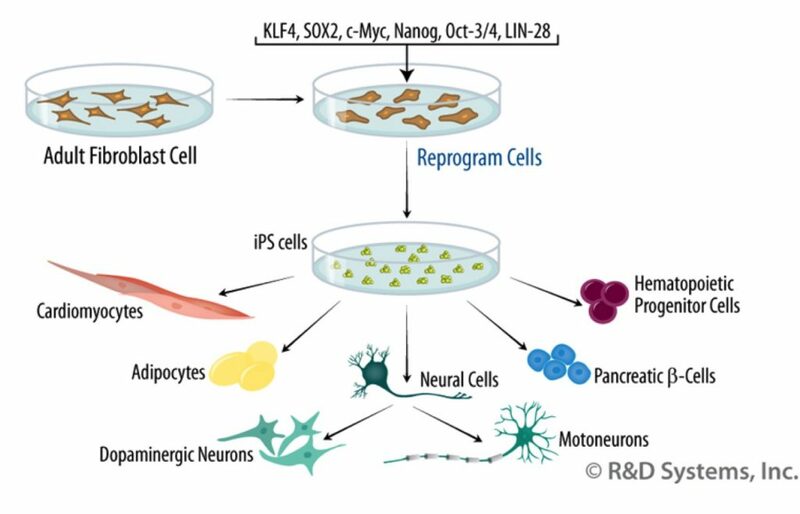 iPSCs can be created from any cell by a method called ‘reprogramming’ and can differentiate into any cell type in the body, such as neurons, cardiac muscle, and blood. 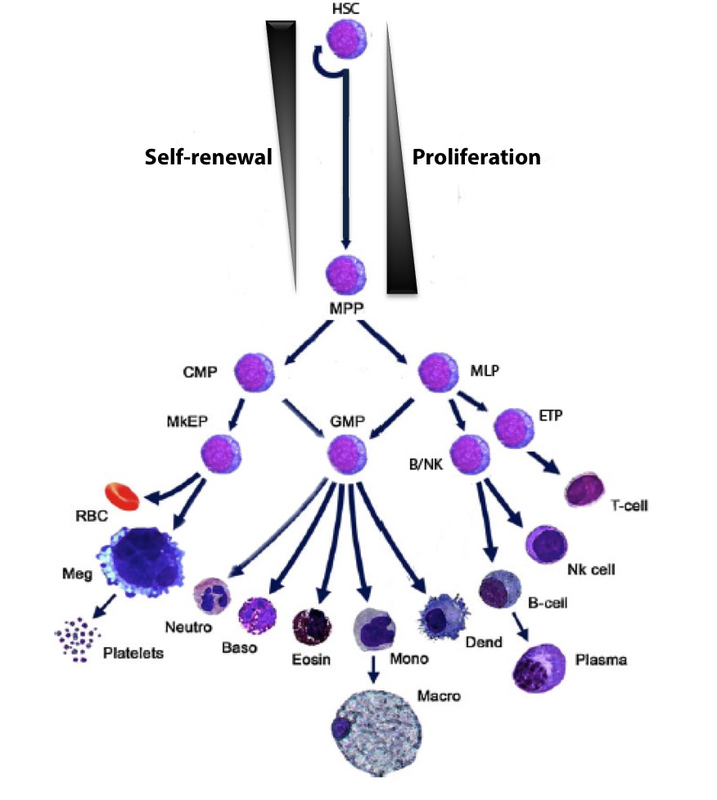 We are looking for ways to instruct iPSCs to become blood stem cells, so that every person who needs a marrow transplant can get one from her or his own cells. Just as iPSCs from healthy individuals can be used to create healthy matched blood cells, iPSCs from patients with blood disorders make diseased blood cells. We can collect bone marrow cells from patients, but there are often too few of these cells to help us understand what goes wrong in these diseases. 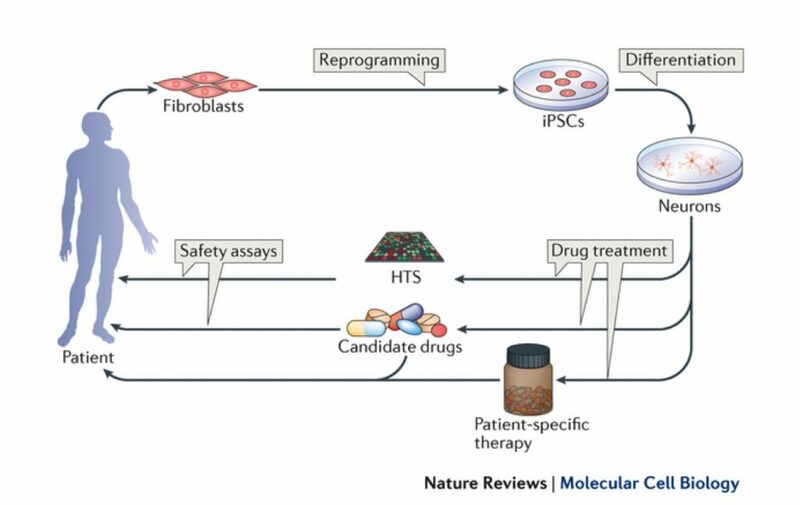 We are using iPSCs from patients with blood disorders to uncover causes of these diseases and to discover candidate therapeutics using high-throughput drug screens. We hope to find cures for inherited bone marrow failure disorders, including Diamond Blackfan anemia, and acquired myelodysplastic syndromes. Our previous work has identified a small molecule therapeutic for Diamond Blackfan anemia. This molecule turns on a cellular pathway called autophagy. It is a damage control pathway that allows cells to recycle damaged components. This pathway has been implicated in many diseases, including neurodegenerative diseases, as well as normal aging. However, much less is known about its role in maintaining a healthy blood system. We are trying to understand the role that this pathway plays in normal hematopoiesis and blood disorders.